Another view of the old Bissets Hotel (see picture #575). It is obviously around Christmas time as the lights are up. I remember the Bissetts Hotel - was even in it once as the niece of the lady that ran it was at school with me. Bissets Hotel was opened by my great grandmother Margaret Cameron Bisset and running it carried on through the family from then. I used to visit Invergordon when I was a small child. We (the Varnhams) rented the renovated house(Bissetts) for about a year before moving up to Gordon Terrace just built. The Bissetts Hotel was still a going affair when I came to work at MK Shands in 1974; it was one of the places I looked at to live. My company had booked me into the Royal Hotel for one week and I was staying there in October 1974 when it went on fire. 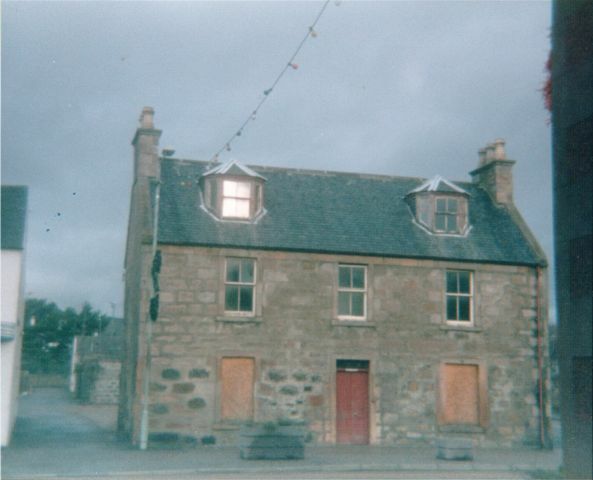 I subsequently went to live in Tarbet House at Kidary.